I tried to unglue Sirocco from Little Bay last week. I pulled up the anchors and brought the boat out into Phinney’s Harbor to a position from which I could leave at any state of tide. Little Bay has a very shallow, unmarked entrance so I can only leave at high tide with Sirocco‘s nearly 6-foot draft. 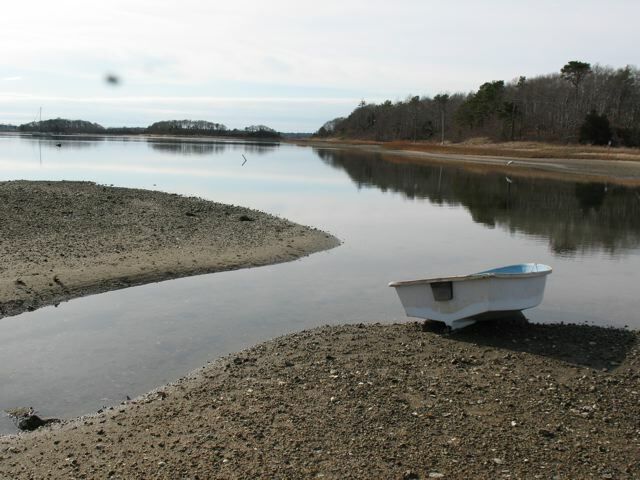 The next day I received word that a dear old friend had died, so I moved the boat back into protected Little Bay, asked the harbormaster for permission to stay on for another week or so, and then drove down the Cape to visit my friend’s husband. Since my departure was delayed I was able to get a few more things done on the boat. The most important job that I completed was the installation of a new alternator. The old one was at the end of its’ useful life, and had actually endured far longer than I ever thought that it would, given the advanced corrosion on all of its’ terminals and hardware and the copious amounts of grease and belt dust choking its’ innards. Since it was working when I removed it I suppose that I will clean it up and keep it somewhere in the farthest reaches of some forgotten locker on Sirocco where it can act as ballast until I finally discard it one day as completely useless. Installing the alternator was not a lot of fun, as removal of the old one was complicated by frozen fittings, the new one is slightly larger, necessitating relocation of the dipstick tube (I still haven’t worked out where that will go yet), and replacement of some wiring. I was getting dripped on by the leaks around the cockpit sole because it was raining during all of the hours that I was bent over the engine performing those tasks. Solving the leaky cockpit sole problem is still on my “to do” list. I made a trip to the masthead two days ago with the idea that I would fetch the masthead light unit so that I can install the new LED lights that I bought from Bebi Electronics, but on arriving at the masthead I discovered that my unit is not equipped with a quick-release feature, so I will have to make another trip up with tools to unscrew the unit from the masthead truck. Hopefully it will come off easily, but that is not how things usually work on the boat. Next time I will take the time to remove all of the mainsail slides from the mast track so that I can put the slides of my “Mast Mate” climbing device into the track. It was not much fun trying to climb that stretchy, twisting piece of webbing while it was hanging free, only supported at both ends. I thought that I could just pull it tight and secure the free end of the unit to the deck to keep it from swinging about, but it has too much stretch for that tactic to be effective. Thanksgiving is next week and though it is difficult to think of having to leave right before the holiday, I think that I should be on my way. The weather has been unseasonably warm for November in Massachusetts, but that weather pattern is coming to an end. It is seasonably cool out today, with the high in the mid-40’s F. That might feel brisk when one can easily return to a warmly heated house, but when out sailing all day on a boat with no heat it can be miserably cold. Still, it would be nice to celebrate the holiday with family… We’ll see what the coming week brings! I have been slowly getting things back to normal on Sirocco after out extended stay here in Massachusetts. I can’t believe that it has been over two months since that beautiful sail up Buzzard’s Bay only days before Irene blew into the area. It has been great spending time with family, but I am ready to get back to living in one place. It has been stressful to be staying at home but visiting Sirocco out at anchor every day. Every time I heard the wind rustling the trees I worried about whether the anchors were holding fast. It is much easier on my mind to be on the boat while she is out at anchor because I know immediately if something is going wrong and am in a much better position to do something about it. Today I spent the morning getting food organized and packed and the afternoon loading it and gear onto the boat. Once the majority of the stores were put away I turned my attention to getting the yankee up on the furler because the wind had dropped to almost zero. By the time I had the sail up and furled it was getting dark, but the moon was close to full and the tide was almost high, so I decided to haul up the anchors and take advantage of the calm weather to exit Little Bay, which has a tricky unmarked entrance. 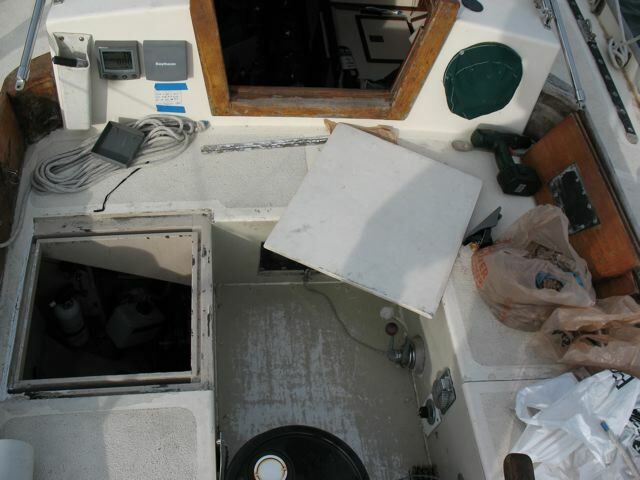 It took me nearly an hour to get the anchors on deck, as I first had to untangle four wraps in the rodes. The quickest method that I have found for untangling the rodes is to unshackle one of the nylon rodes from its’ chain, unwrap the turns, and then re-shackle the rode back together. With all of the gear on deck I motored two miles over to anchor off of Monument Beach. I set two anchors and put the Sirocco to bed for the night. In the next couple of days I will point her bow south. I am not sure how far we will go this year. Rather, I will stay open to the possibility of finding the perfect winter haven anywhere along the way, although I do imagine going at least as far as North Carolina. Any farther north than that would be a test of endurance since there is no heat aboard Sirocco.